Great horned owls (Bubo virginianus) are a large species of true owls that inhabit many parts of North and South America. These nocturnal avian hunters take a wide range of prey including mammals, other birds, reptiles, and amphibians. Great horned owls were first described in 1788 by Johann Friedrich Gmelin, a German naturalist who published the 13th edition of Systema Naturae by Carolus Linnaeus. That edition included a description of the great horned owl and gave it the scientific name Bubo virginianus because the species was first observed in the Virginia colonies. Sometimes called hoot owls, great horned owls range in length from 17 to 25 inches, have a wingspan of up to five feet, and an average weight of 3.2 pounds. They are the second heaviest owl in North America (after the Snowy Owl), and they are powerful hunters that can grip and crush a full-grown rabbit: their talons form an oval between 4–8 inches in diameter. 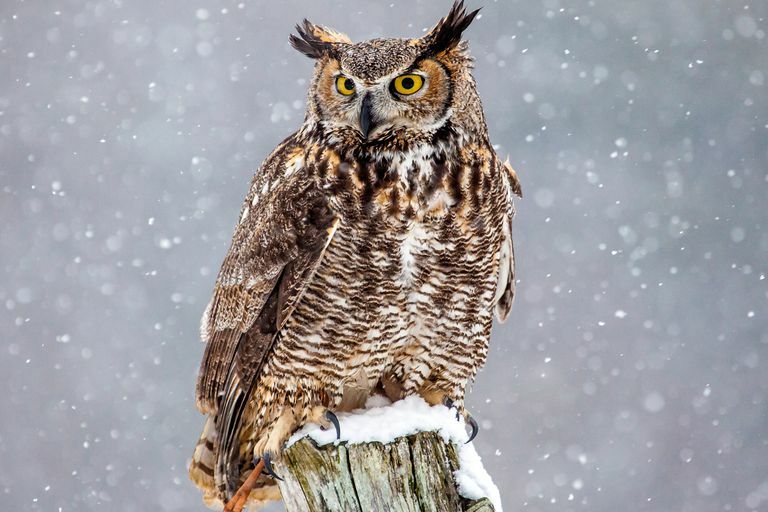 There's a good chance that you've heard the hoo-hoo-hoo call of the great horned owl if you've spent any time in the woods at night; young great horned owls will hiss or screech, especially when disturbed or frightened. Characteristics vital for their hunting success include large eyes, excellent hearing and silent flight. Their eyes are adapted for night vision but are relatively immobile, directed forward. To compensate, their cervical vertebrae are quite flexible, allowing owls to turn their head over 180 degrees. Great horned owls have prominent ear tufts atop their head, one of several owl species that possess ear tufts. Scientists disagree as to the function of these ear tufts: Some suggest that the ear tufts serve as camouflage by breaking the contour of the owl's head, while others suggest that the tufts serve some role in communication or recognition, enabling the owls to convey some kind of signals to one another. Experts agree though, that the ear tufts play no role in hearing. Because they remain largely inactive during the day, great horned owls are cryptically colored—that is, their coloration is patchy so that they can blend with their surroundings while they rest. They have a rust-brown colored facial disk and white feathers on their chin and throat. Their body is a mottled grey and brown color above and barred on the belly. Great horned owls occupy the most extensive range of any owl species, including most boreal forests of North and South America, from Alaska and Canada, southward throughout the United States and Mexico, into Northern parts of South America and throughout Patagonia. Since they find hunting is somewhat difficult in thick forests and underbrush, owls prefer habitats with open clearings near secondary-growth woodlands and tree-edged meadows and swaths. They also adapt well to human-modified environments, agricultural fields and suburban areas where there are places to perch and open fields to hunt in. Great horned owls are carnivores who eat a very wide range of prey. Like all owls, these fascinating carnivores eat their prey whole and then regurgitate "pellets" containing fur and crushed bones. Usually active at night, they are also sometimes spotted during the late afternoon or during the hours around dawn. These unique and beautiful birds prefer to eat rabbits and hares but will settle for any small mammal, bird, reptile, or amphibian that comes within its reach. They are the only animal that feeds on skunks; they also hunt birds such as American crows, peregrine falcon nestlings, and osprey nestlings. They require an average of 2–4 ounces of meat per day; larger animals are killed and may be fed on for several days. Great horned owls nest during the months of January and February. During mating season, male and female great horned owls hoot back and forth to each other in a duet. Their mating rituals also include bowing to each other and rubbing bills. When ready to nest, they do not build their own nest but instead seek out existing sites such as the nests of other birds, squirrel nests, tree holes, crevices in rocks and nooks in buildings. Some great horned owls mate for many years. Clutch size varies with latitude, weather, and food supply, but generally, are two or three eggs. When prey is available, nesting begins earlier in the year; in leaner years, nesting is later and sometimes owls will not lay eggs during very poor years. Great horned owls are long-lived birds, known to live a typical 13 years in the wild, and have been known to live as long as 38 years in captivity. Their biggest threats come from the activities of human beings, who shoot and trap owls, but also build high-tension wires and run into owls with their cars. Owls have few natural predators but are occasionally killed by members of their own species or by northern goshawks, a species that often battles with the owls for available nesting sites. The International Union for Conservation of Nature (IUCN) classifies the great horned owl as Least Concern. Armstrong, Aaron. "Eagles, Owls, and Coyotes (Oh My! ): Taphonomic Analysis of Rabbits and Guinea Pigs Fed to Captive Raptors and Coyotes." Journal of Archaeological Science: Reports 5 (2016): 135–55. Print. "Bubo virginianus." BirdLife International. 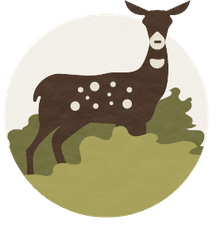 The IUCN Red List of Threatened Species 2018: e.T61752071A132039486, 2018. Newton, Ian. "Chapter 19: Irruptive Migrations: Owls, Raptors and Waterfowl." The Migration Ecology of Birds. Ed. Newton, Ian. Oxford: Academic Press, 2007. 563–86. Print. Smith, Dwight G. "Wild Bird Guides: Great Horned Owl." Mechanicsburg, Pennsylvania: Stackpole Books, 2002.